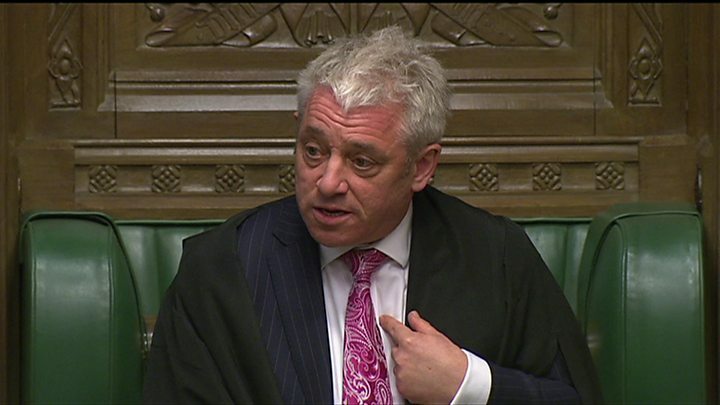 Commons Speaker John Bercow has defended Parliament, telling MPs "none of you is a traitor". His comments come after Theresa May told the public she was "on their side" and blamed the delay to Brexit on MPs. SNP MP Pete Wishart accused the prime minister of irresponsibility, while Labour's Paula Sherriff urged her to "dial down the hate". A spokesman for the prime minister "flatly rejected" the suggestion that her comments had put MPs at risk. Speaking from Downing Street on Wednesday evening, Mrs May said the public were "tired of infighting and political games" and it was "high time" politicians made a decision on the next steps. SNP MP Pete Wishart said it was "the height of irresponsibility by the prime minister to pitch the public against Parliament in this current climate". He added that there were a few MPs feeling "just a little bit more insecure this morning". Labour MP Paula Sherriff told MPs that she had received messages saying that her head should be "chopped off". She said she had spoken to the prime minister last Thursday and had "begged her to dial down the hate". "People are frightened, not just in this place, but in the country as a whole," she said. "The prime minister must show some leadership." She called for a debate on how MPs "love our country, want the best for our country and how there is much more that unites us than divides us". Earlier, Remain-supporter Tory MP Sam Gyimah, who quit as a minister over her deal, described her remarks as "toxic" and said the "blame game" was "a low blow". Labour's Lisa Nandy called Mrs May's statement as "disgraceful" for "pitting Parliament against the people", while fellow Labour MP Wes Streeting added it was "incendiary and irresponsible" at a time when some MPs had received death threats. Conservative Dominic Grieve said: "Simply browbeating MPs into submission serves no purpose at all," adding "it brings us, the government, Parliament and democracy itself into contempt." Addressing MPs, Speaker John Bercow said: "None of you is a traitor - all of you are doing your best. "I believe passionately in the institution of Parliament and in the rights of members of this House and in their commitment to their duty," he said. "The solemn duty of every MP is to do what he or she thinks is right." Leader of the House of Commons Andrea Leadsom said: "All of us want to do the best for our country and our society. "MPs need to be treated with respect and given the opportunity to represent their own constituents and their country in alignment with their beliefs. "I will do everything I possibly can to ensure we can all go about our business."